If you’ve ever visited my tiny corner of the internet for even a fraction of a second, you’ll know I love overnight oats that taste like dessert. And from the feedback I get from you guys, I know you love them, too! I mean, who could say no to a jar of cinnamon roll overnight oats or chocolate chip cookie dough overnight oats for breakfast? Well, since all my overnight oats recipes area healthy, you never have to. Yay! Oats have a bit of a bad reputation for being boring. But with so many amazing oatmeal and overnight oats recipes out there, eating oats never has to be boring. You could easily eat a bowl of oats every single day for a year and never repeat a single recipe! 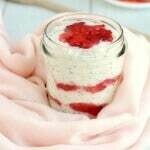 Except for these strawberry cheesecake overnight oats. But you’d be repeating this recipe because it’s. Just. That. Good. There’s no buttery graham cracker crust in this healthy overnight oats recipe. If you’re like me and think that’s the best bit, go ahead and crumble a graham cracker on top! There are 30 calories in 1 graham cracker (or 60 calories in 1 Digestive biscuit if you’re British) which is just a tiny indulgence for an extra layer of yum. Go on, I’m sure you deserve it. But if you’re really watching your calories (good on you!) you don’t need the buttery base. 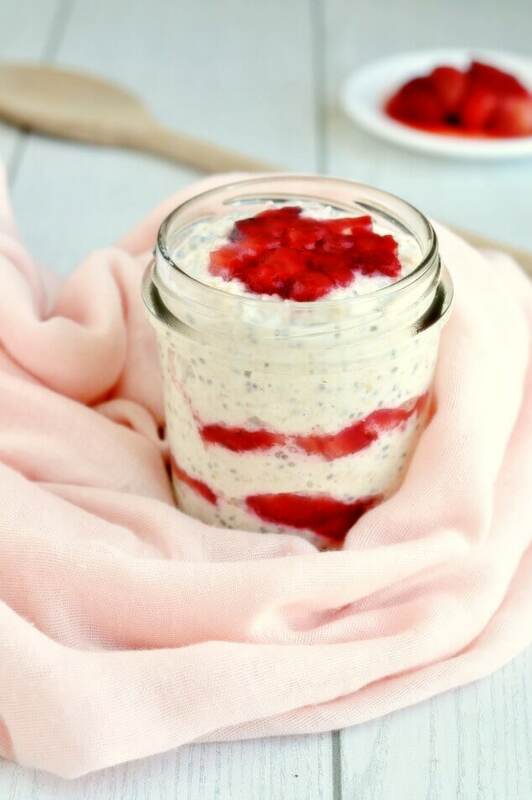 When you’ve got a great big jar of wonderfully creamy cheesecake-flavoured overnight oats layered with sweet, juicy strawberries, you don’t have to add anything else to make this healthy breakfast recipe awesome! To make gluten-free strawberry cheesecake overnight oats, simply use gluten-free oats. Can I leave out the chia seeds? Even though chia seeds are bursting with goodness, I get they’re not everyone’s thing. If you’re really not into chia seeds, just skip them. They help thicken the strawberry cheesecake overnight oats up a bit, but the recipe works fine without them, too. 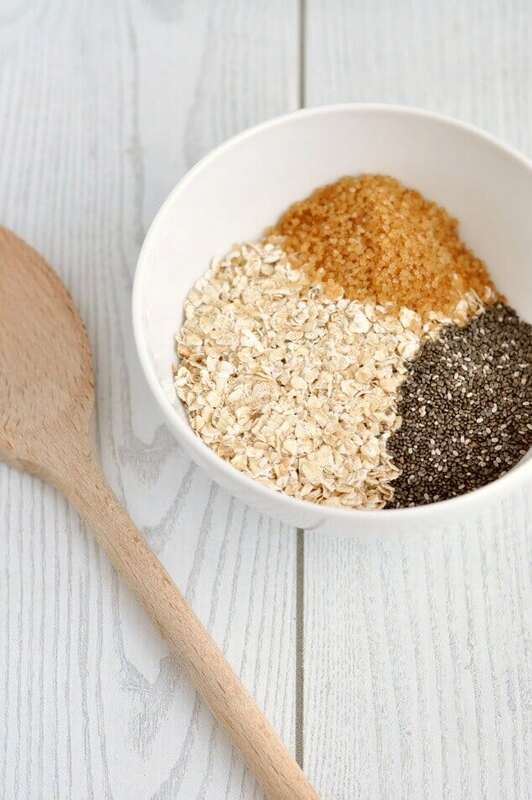 But if you’re looking for an easy way to get extra vitamins, minerals and loads of fibre into your diet, I definitely recommend you pick up a bag of chia seeds and use them for this recipe. I’m never one to turn down dessert, but you know what? I find that a half serving of these overnight oats makes the perfect afternoon snack or dessert! Half a portion comes in at less than 150 calories, is sweet enough to satisfy any sugar craving and is packed full of fibre so you’ll definitely feel full. 10 more healthy overnight oats recipes! Can’t get enough of healthy overnight oats recipes? Then you’ll absolutely love my ebook: 10 Healthy Overnight Oats Recipes That Taste Like Dessert! From chocolate peanut butter cup overnight oats to Starbucks cranberry bliss bars overnight oats – it’s full of awesome healthy breakfast recipes that’ll have you leaping out of bed in the morning. Click here to sign up for my newsletter and I’ll send you the ebook for free and say goodbye to boring breakfasts for good! 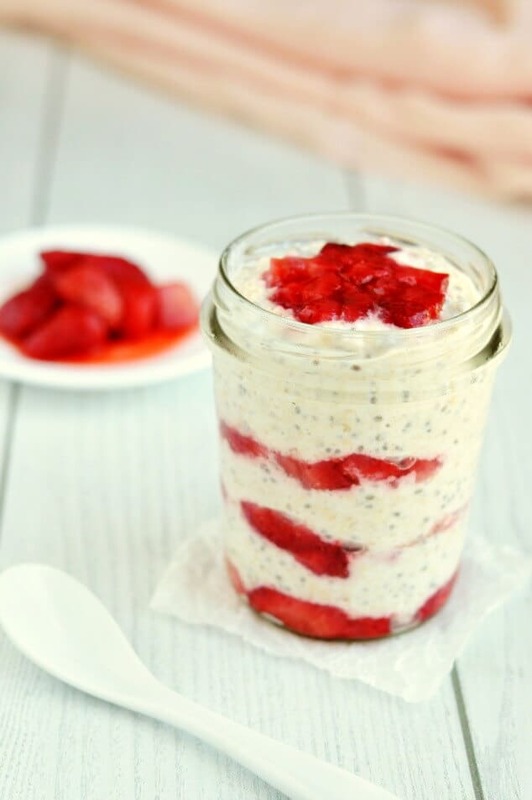 Enjoy dessert for breakfast with these strawberry cheesecake overnight oats. Vegan, dairy-free, gluten-free and low FODMAP variations so everyone can enjoy a sweet treat in the morning! Place all the ingredients (except the chopped strawberries) into a small bowl and stir until combined. Layer the oat mixture into the jar with the strawberries alternatively. You can do as many layers as you like. Place in the fridge and leave for at least 4 hours to chill and thicken before eating. 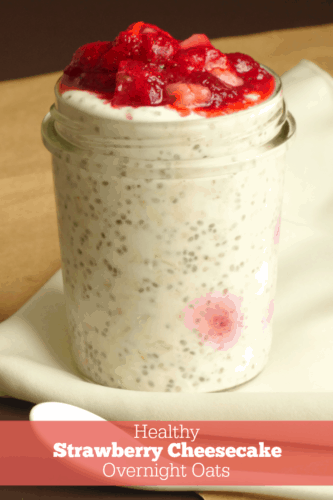 If you use a zero-calorie sweetener, 1 serving of strawberry cheesecake overnight oats comes in at 270 calories. Thanks for the recipe! I’m totally making this! My daily plain oatmeal is getting pretty boring. Is it 1 or 2 tablespoons of cream cheese? I see it listed twice. I’m guessing it was unintentional. Have you tried these without the stevia, by chance? Oats never thrill me–but this actually looks legit amazing. I am going to have to try it, I think I have all the stuff on hand! Excuse me while I get up off the floor after fainting at the idea of someone not loving oats! Only kidding! I eat oats every day and almost get withdrawal symptoms when I have a difference breakfast! 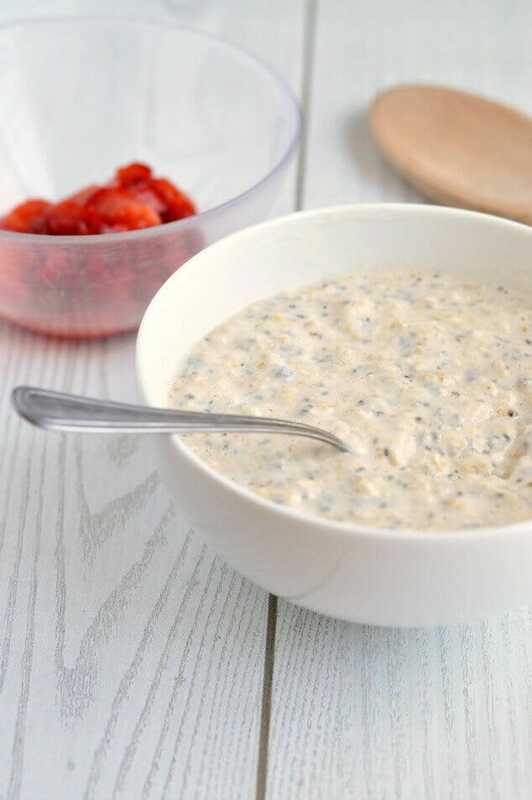 Hope these overnight oats change your mind and turn you into an oats lover! This looks so creamy and the perfect way to start the day (with coffee too, of course 😉 ). Thanks so much, Dawn! And you’re definitely right – can’t start your morning without a coffee! These look so good, they make for such a delicious breakfast! This looks super delicious! I am also a fan of dessert for breakfast, so this is a go for me! Thanks so much, Amy! Who doesn’t like eating dessert for breakfast?! Hi Caitlin. You can definitely use frozen strawberries! Just be aware that as they defrost, they’ll release a lot of liquid and might make the oats a bit watery. I’d recommend popping them into the microwave to defrost before using them. Thank you for this recipe! I use half and half instead of the almond milk so my husband would try it and we have a winner! He likes it and it has become a staple in our meal plan. I am looking through the rest of your site for more ideas. Again, thank you! Thanks so much, Trinette! Using half and half sounds like it would be amazing! I’ve got to give that way a try. Do you heat them up in the morning then? These are sooo good! I love them! I have tried other overnight oats, but these are the best so far! I did make it a little more unhealthy by adding in a few semi sweet chocolate chips, sometimes I need to get a little chocolate fix in there! ?